Jean Jullien is a French artist, living and working in London. After graduating from Central Saint Martins and the Royal College of Art, Jean has gone on to become one of the finest young illustrators working today, producing a coherent body of work full of bold graphics and clever wordplay. 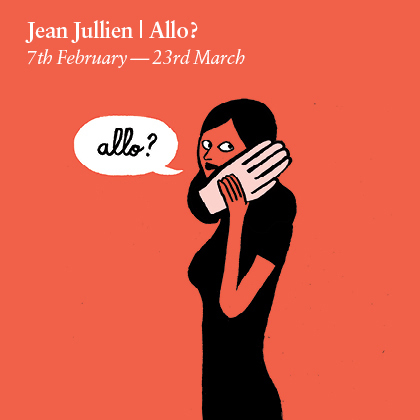 Kemistry are excited to host Jean Jullien’s first solo show in London, Allo?. Intrigued by everyday life and human interaction, Allo? explores our social and asocial behaviours, the relationship between people and how we communicate with one another. There will be a range of prints, posters and t-shirts available for purchase at the gallery and online, each print will be limited, signed and numbered by Jean Jullien.